DENVER, March 14, 2018 /PRNewswire/ -- DaVita Kidney Care, a division of DaVita Inc. (NYSE: DVA), a leading provider of kidney care services in the United States, honors Registered Dietitian Nutritionist Day by recognizing its more than 2,000 registered dietitians across the U.S. and in 11 countries around the world. "We celebrate National Nutrition Month® and National Registered Dietitian Nutritionist Day in March. 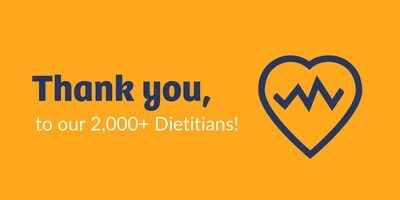 This special time is to honor the professional passion and dedication of dietitians and the impact they have on individuals' overall health and well-being," said Debbie Benner, vice president of clinical support for DaVita Kidney Care. "Dietitians use the science of nutrition to enable people to make personalized, positive lifestyle changes. This is especially true for patients with chronic diseases such as kidney disease, diabetes and hypertension." Better nutritional status, by assessing nutritional intake and biochemical parameters. For example, they provide individualized meal plans based on patients' unique needs and preferences. Mineral and bone disorder management through education that considers disease state, laboratory results, medications and dietary aspects. Fluid balance, by providing easy-to-follow tips to help manage sodium and fluid intake. Dietitians also offer suggestions for healthy, flavorful alternatives to high sodium foods. "DaVita's focus is on the individual and their unique needs," said Allen R. Nissenson, M.D., FACP, chief medical officer for DaVita Kidney Care. "Our dietitians lead this effort by listening to each patient's preferences, considering cultural aspects and then guiding patients to make lifestyle choices that can positively impact their overall health and well-being." DaVita dietitians are trained extensively in motivational interviewing. This skill enhances their ability to engage patients and positively influences their ability to reach their personal health goals. For more information about a kidney-friendly diet, visit the DaVita® Kidney Diet Tips blog at Blogs.DaVita.com.